Born on January 9, 1912 in California, John Lansdale graduated from Harvard law school and joined a Cleveland, Ohio law firm in 1936. He enlisted in the US Army when the United States entered World War II. 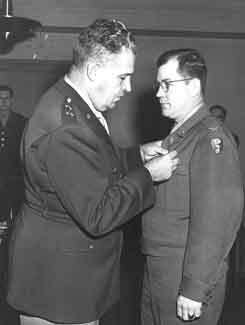 The senior military officer for the secret atomic bomb project, the Manhattan Project based at Los Alamos, New Mexico was Brigadier General Leslie Groves, who chose Lansdale to be his chief of security and intelligence after Lansdale had shown himself adept at military security (the adjacent image is of Colonel Lansdale being awarded the Legion of Merit by Groves for his work on the Manhattan Project). Lansdale had to accommodate and sift through Robert Oppenheimer's list of physicists and other scientists, academics all, many among them refugees and with socialist tendencies. Once the project engaged, Lansdale often had to mediate between the scientists who demanded academic openness, and Groves who naively thought he could get the best out of Oppenheimer's crew by keeping hem separate and apart. And there were spies about. Julius Rosenberg and his wife Ethel were both later executed for giving Manhattan Project secrets to the Russians. Lonsdale was also worried about the wife of Dr. Oppenheimer, Katherine Oppenheimer. She was German-born and her first husband, a known Communist. But after the war, when the 1950s Communist witch-hunt took aim at Oppenheimer, Lansdale firmly supported his former colleague. John Lansdale was an outstanding soldier, and not just a desk jockey. "Lansdale ... had been chosen by the project's director, Gen. Groves, to lead a strike on a factory in Stassfurt in northern Germany, where General Groves suspected the Germans had a cache of bomb materials. "On April 17, Colonel Lansdale and his team raided the plant and found about 1,100 tons of ore, some in the form of uranium oxide, a basic material of atomic bombs. In less than a week, the ... mission had also captured several prominent German atomic scientists, including Werner Heisenberg and Otto Hahn." After the war, Lansdale returned to the practice of law with the firm Squire, Sanders, and Dempsey in Cleveland and later in Washington. He retired from the practice of law in 1987. The war hero died on August 22, 2003 in Maryland.